Several real ales on during my visit unfortunately the young lady serving lacked the skill to pour a proper or a full pint. Premises were a bit dull and dingy but I bought a second round to see if things would improve. It didn't. Not one of the cheaper bars in York either. Seems to be mostly catering for the tourist trade. Certainly will not be rushing back. 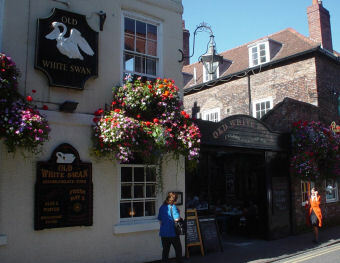 Large multi-roomed Nicholsons pub in the centre of York, with a number of different bars. Different ales are on in some of the bars. The beer selection was Leeds Pale, Thwaites 13 Guns, Woodfordes Norfolk Hawker, Nicholsons Pale Ale, John Smiths Cask, Fullers London Pride, Marstons Pedigree, Kirkstall Three Swords, Broughton Brewers Gold, Sambrooks Lavender Hill & Artisan Amarillo. No real ciders, as far as I could see. But I did try a Weston's Mortimer's Orchard cider from the keg - one I hadn't seen before. Busy. But there was plenty of seating. 4th pub in York, another Nicholsons house...with a good and varied range of ales. 5 ales on the hand pumps, my choice was Jarrow Brewery's Isis @ 5.0%, another quality pint. Superb barman, not come across a guy this good for a long time. I commented on he's cheerfulness...truly a good worker with a smile on he's face....you don't see in London very often! Large pub that on the day I visited had a separate bar and dining room, though the dining room was not that busy when i walked through it. High vaulted ceilings, with wagon wheels on display. Again a quality town centre pub. A Nicholson's pub. Sprawling with several different seating areas and bars and plenty of wood paneling. The staff were friendly and attentive. Lots of real ales on offer. Yorks Terrier, Titanic Cappuccino, Doombar and Nicholson Pale Ale were just a few. Went here on a Saturday lunchtime before going to the football. The staff were very welcoming and attentive. A good choice of ales and of good quality, the service and food were both good. Worth a visit.